From approximately June to August every year, the floodwaters recede from the forest and the river level drops to reveal smooth sandy beaches at the Tapiche Reserve. This is when our river turtles climb up onto the sand at night to lay their eggs under the moonlight. We have three species of river turtle that nest during this time, the Arrau turtle (Podocnemis expansa) locally known as "charapa," the Six-tubercled Amazon River turtle (Podocnemis sextuberculata) locally known as "cupiso," and the Yellow-spotted Amazon river turtle (Podocnemis unifilis) locally known as "taricaya." Both the cupiso and taricaya are classified as Vulnerable by the IUCN (International Union for the Conservation of Nature), meaning these species face a very high risk of extinction in the wild. Sadly, lack of local law enforcement and the popular practice of consuming the turtle and its eggs, particularly the taricaya, leaves poaching unmonitored and even culturally accepted as a means of income. Considered an exotic delicacy, turtle eggs fetch a high price on the black market due to market demand in Iquitos, Lima and beyond. Poachers will often wait for a female to finish laying her eggs before taking the turtle as well as all of her eggs, effectively ending the life cycle of the species. 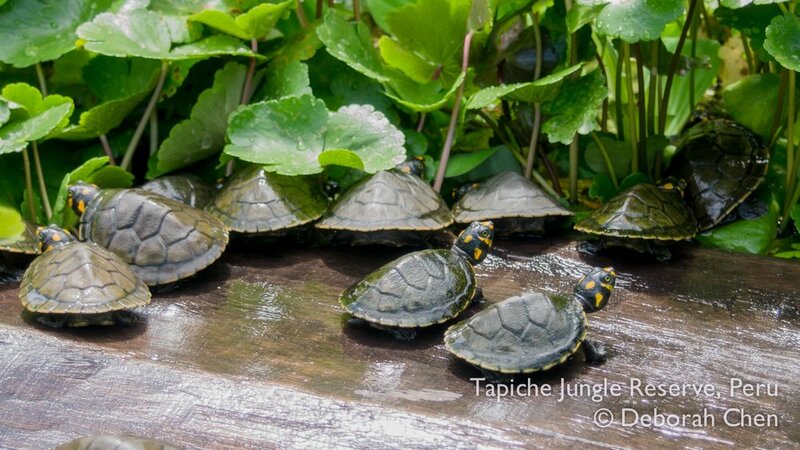 Along the 400 km of river between Iquitos to the Tapiche Reserve, you will not see these turtles anymore because of egg and animal poaching, even though the river is their natural habitat. The absence of these animals outside of the Reserve puts ever more pressure on us to protect the animals we have on the property. During turtle nesting season, we try to collect the eggs before the poachers get to them. We re-bury the eggs on the beach in front of the lodge, enclosing the areas with protective fencing. After the eggs hatch, we foster the hatchlings until their shells have hardened and they have better chances of surviving. We then release them on the river and at lagoons inside the reserve to begin the next phase of their life and bring balance back to the ecosystem. Read about whether Tapiche is right for you, or Contact Us to book a trip or discuss volunteer opportunities.